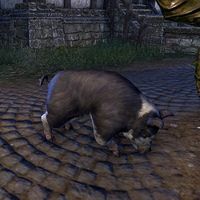 Glutton is a pig found in the city of Daggerfall and the property of Swineherd Wickton. "<The pig devours a huge chunk of the strange, thorny vine.>"
What have you gotten into now, pig? "<The pig squints up at you before returning to its feast. It devours the tender roots with surprising gusto.>"
I see how you got your name. This page was last modified on 6 September 2018, at 09:33.